Caption slip reads: "Photographer: Swaim. Date: 1958-05-27. Reporter: Swaim. Assignment: New clinic, City of Hope ribbon cutting for new heart clinic. 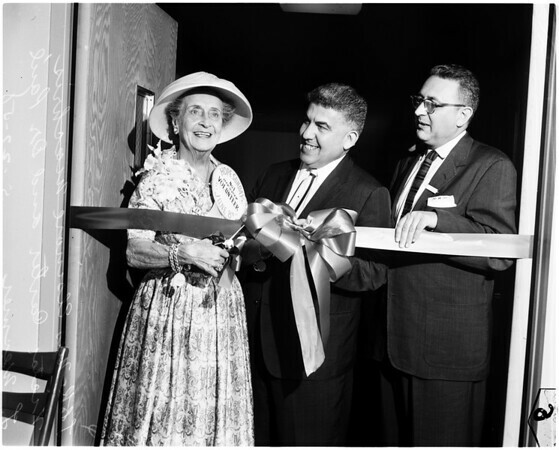 9/10: L to R Mrs. Elsinore Machris, Victor Carter, City of Hope chairman of council, and Dr. Paul L. Wermer, member of medical staff. 5/6: L to R Mrs. Elsinore Machris, Victor Carter, charim [sic] of Supreme Council, City of Hope, and Lieut. Gov. Harold J. Powers. 7: L to R Victor Carter, Mrs. Elsinore Machris, Lieut. Gov. Harold J. Powers, chairman of opening, and first vice pres. of City of Hope".